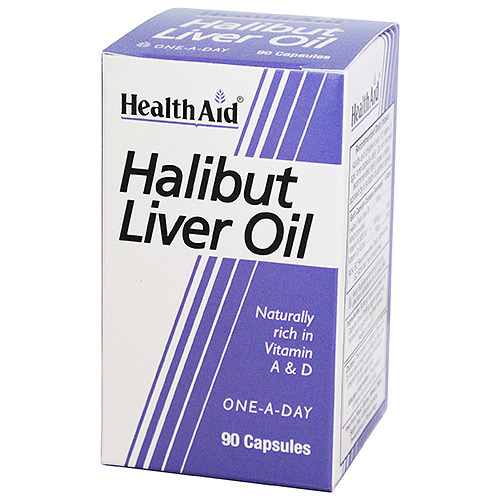 HealthAid Halibut Liver Oil Capsules are a natural source of Vitamin A and D. Vitamin A plays an essential role in the maintenance of eyes, skin, hair health. Vitamin D helps control calcium and phosphate levels in the body thereby helping to maintain bones and healthy teeth in growing children and adults. Bulking Agent (soybean oil), Capsule Shell [gelling agent (gelatine), humectant (glycerol, purified water)], Halibut Liver Oil. Adults and children over 12 years of age, one capsule daily. Do not exceed recommended daily intake unless advised by a suitably qualified person. This product contains Vitamin A.Do not use if pregnant or likely to become pregnant except on advice of a doctor or ante-natal clinic. This product contains fish oils and soya. 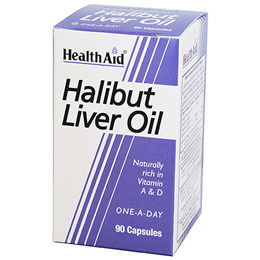 Below are reviews of HealthAid Halibut Liver Oil - 90 Capsules by bodykind customers. If you have tried this product we'd love to hear what you think so please leave a review. Excellent, fast service and a good quality product at a sensible price. This product appears to have disappeared from High Street retailers, but seems to be readily available from bodykind. Good price and usual good service. Good product good price I would recommend this,thank you.